Cover of 2008 edition published by Herald Press. 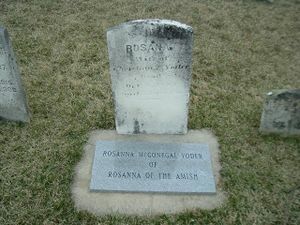 Tombstone of Rosanna McGonegal Yoder (d. 1895), Rosanna of the Amish. Source: Locust Grove Mennonite Cemetery website. Rosanna of the Amish (319 pp. ), a semifictionized biography, written and published in 1940 by Joseph W. Yoder (1872-1956) of Huntingdon, Pennsylvania, himself a lifelong member of the Mennonite Church. 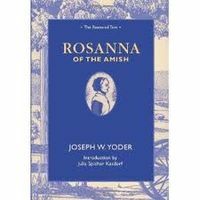 The book relates the life story of his mother, Rosanna (McGonegal) Yoder (10 March 1838, Halfmoon Valley, Centre County, Pennsylvania - 9 October 1895, Pennsylvania), daughter of Patrick McGonegal (ca. 1804 - 5 August 1837, Philadelphia, Pennsylvania) and Bridget "Peggy" O'Connor (1810-ca. 1835). Rosanna was an Irish Catholic orphan who was reared in the home of Christian Kauffman (10 April 1810, Berks County, Pennsylvania - 30 August 1846, Juniata County, Pennsylvania) and Elizabeth (Yoder) Kauffman (14 December 1804, Mifflin County, Pennsylvania - 2 June 1877, Mifflin County, Pennsylvania), an Old Order Amish couple (Rosanna's step-father was Samuel "Shem" Yoder [20 September 1801, Mifflin County, Pennsylvania - 22 March 1884, Union Township, Mifflin County, Pennsylvania]). Rosanna married a young Amishman, Christian Z. "Crist" Yoder (27 March 1837 - 26 September 1915, Mifflin County, Pennsylvania), and remained a loyal member of the Amish church until her death. The book gives an unusually clear and accurate picture of the brighter side of Amish life and culture. It is frankly autobiographical and contains the name of only one fictitious character, Simon Riehl, who is introduced to describe an Amish excommunication and the consequent "Meidung." Commendable Amish traits, German, perhaps, as well as Amish, receive proper emphasis: honesty, frugality, humility, hard work, joy in the completion of a task well done, friendliness, and neighborliness, all suffused with a deep religious piety. The volume catches with remarkable success the happy, joyous community spirit where interest in the simple, homely virtues and in one another's welfare enables the group to face life with an upward look and a clear conscience. It also records faithfully the religious and cultural practices of the Old Order Amish in Mifflin County, Pennsylvania. In spite of evident literary shortcomings the volume deserves the popularity that has made numerous reprintings necessary. The pen sketches by George Daubenspeck add interest and value to the volume. Hartzler, Betty Graber. "Amish-Mennonite Kishacoquillas Valley Database." 11 July 2013. Web. 5 October 2013. http://wc.rootsweb.ancestry.com/cgi-bin/igm.cgi?db=kishvalley. Kauffman, S. Duane. "Rosanna of the Amish: Fact or Fiction?" Pennsylvania Mennonite Heritage (July 2008). Reviewed in Mennonite Quarterly Review XV April (1941): 143-47. Umble, John S and Richard D. Thiessen. "Rosanna of the Amish." Global Anabaptist Mennonite Encyclopedia Online. October 2013. Web. 19 Apr 2019. http://gameo.org/index.php?title=Rosanna_of_the_Amish&oldid=133215. Umble, John S and Richard D. Thiessen. (October 2013). Rosanna of the Amish. Global Anabaptist Mennonite Encyclopedia Online. Retrieved 19 April 2019, from http://gameo.org/index.php?title=Rosanna_of_the_Amish&oldid=133215. Adapted by permission of Herald Press, Harrisonburg, Virginia, from Mennonite Encyclopedia, Vol. 4, p. 358. All rights reserved. This page was last modified on 28 December 2015, at 06:52.